Silicon Valley–backed Bridge International Academies repeatedly failed to comply with national education standards. 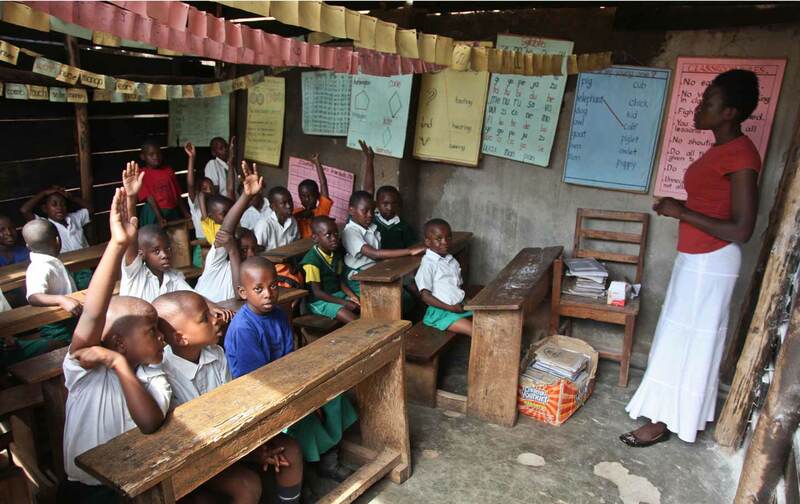 Africa’s poorest schools are a gold mine for the corporate education industry. The Global South is awash in corporate school programs marketed as private alternatives to traditional brick-and-mortar schools. But in early November, Ugandan officials suspended the operations of Bridge International Academies upon realizing the education franchise’s “academy in a box” model was coming apart at the seams. The crackdown was spurred in part by a months-long investigation by Education International (EI), a global teachers-union federation, which illustrated how the fee-charging schools relied on “teacher computers,” in ramshackle facilities. Following the court ruling, Bridge International issued a statement of opposition, contending that the move “threatens to undo the critical work Bridge has done to broaden education opportunities that provide many thousands of Ugandan children with the best chance they have to escape generational poverty and achieve success.” Currently Bridge International plans to continue working on licensing schools and meeting regulatory requirements. With roughly 120,000 students in about 520 schools, mostly in Kenya, along with 117 in Uganda and Liberia and, and four in India, Bridge is a heavy hitter in the global ed-tech industry, projecting to grow its enrollment to 10 million by 2025. Bridge International’s brand is backed by tech heavy-hitters as well as the UK’s aid authority. Its founder, Jay Kimmelman, also founded the massive educational-software company Edusoft, and the company has been supported by Facebook’s Mark Zuckerberg’s Chan Zuckerberg Initiative, as well as mega philanthro-capitalists including the Clinton Global Initiative and the Gates Foundation. Students, after all, are consumers; interchangeable “facilitators” can be easily replaced. The curriculum they are using has never been approved by the National Curriculum Development Centre.… They should come and discuss with the Ministry accordingly and not just implement what they think without us knowing. The tensions between multinational investments and state authorities tie into the complex history of education, national sovereignty, and postcolonial politics in Uganda. Historically, schooling has been divided between state-led institutions and private missionary academies. But the market liberalization onslaught of the 1980s and 1990s led to the rapid privatization of public services and disinvestment in public education, according to EI. Now schools have again become neoliberal battlegrounds for “social control and private gain,” and positioned private education providers as a neocolonial missionary, delivering programmed tablets in lieu of qualified educators. The point is not that Ugandan schools weren’t, like many in the Global South, severely under-resourced before the government embraced edu-tech investors. But the decision to shutter the schools reflects frustration with corporate impunity. The education ministry even noted that, in addition to the licensing issues, “the health and safety of the learners were put at risk as evidenced by the overflowing pit latrines.” For such facilities, EI reports, families pay up to $150 per year, or about a quarter of a typical family income. And multinational managers reportedly use their mobile networks to “instantly track students who have not yet paid school fees” and demand payment. Although Bridge International represents a corporate/industrial education model made for mass distribution through neoliberal capital flows, education unions see little room in the academy in a box for the teacher-student interactions and public social mission that should guide a public education system. Filling the educational deficits of the Global South may be more a product of social solidarity than cloud networking.